"Dr. Preeti Rana is a caring and sensitive doctor. Her bedside manner is second to none." "Having him as your primary doctor might just save yours. He is that good." "Best doctor in the area and love his staff." "Dr. Rana has been my mother's doctor for the past 3 years and he's the greatest." "Dr. Vasilopoulos is the most caring doctor I have ever been to." "I was very impressed with her medical knowledge and skill." "The best and most knowledgeable doctor I know." Dr. Preeti Rana was born and raised in India. It was her desire to make a difference in people's lives. She received her Internal Medicine training both in India and at Saint Barnabas Health System in West Orange, New Jersey. She loves the art of medicine and has keen interests in primary care, hypertension, diabetes, obesity and preventive medicine. She strongly believes in establishing a professional relationship with her patients, such that her patients can feel comfortable in discussing any health-related issues. Dr. Preeti Rana is affiliated with INOVA Alexandria Hospital and Virginia Hospital Center. 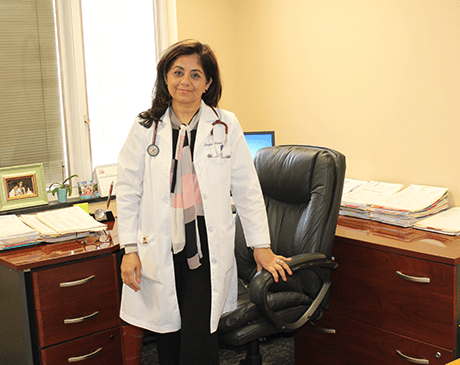 Dr. Preeti Rana is board certified in Internal Medicine. "Dr.Rana is extremely knowledgeable and has used techniques to get my kidney function back on track where previous specialists have failed." "Helpful and responsive staff, and Dr. Rana is very friendly and knowledgeable...Bottom line, I trust Dr. Rana and his staff with my health, and that means something." "Dr. Farooqi is a kidney expert and quickly diagnosed that my Mother had a UTI with other issues and took quick action." "Dr. Rana projects a positive attitude on every visit. He works closely with my primary physician on my kidney issue. The staff is courteous and friendly." "Dr. Rana is my mother's doctor and has been for the last year. He has provided superior care along with a caring and concerned bed side manner." "Dr. Rana is considered one of the top 5 Nephrology Fellows of all time at UMDNJ-New Jersey Medical School."